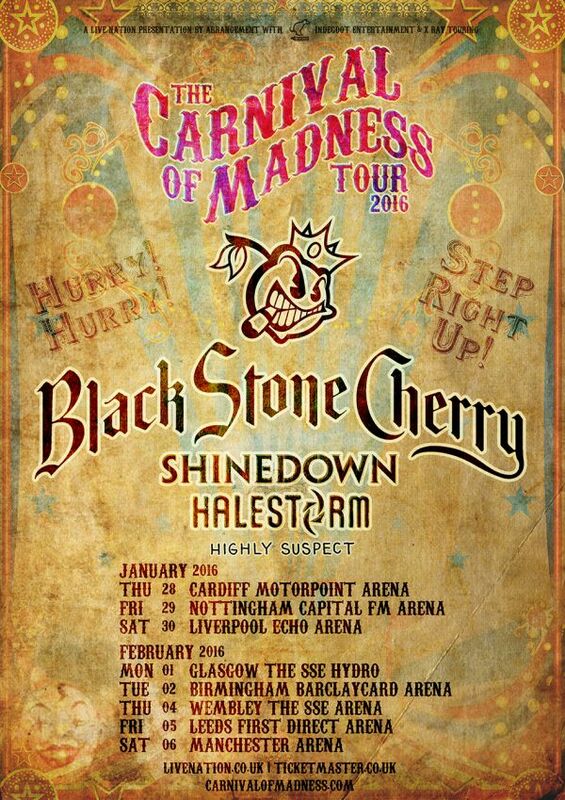 Just announced, Black Stone Cherry – who are playing a couple of UK dates including Download in the next few days (and we’re interviewing Jon tomorrow!) – will be back at the big venues early in 2016 along with Shinedown and Halestorm. Opening the festivities will be Brooklyn band Highly Suspect. The three major bands are no strangers to each other, having toured together on several occasions within the UK. Halestorm opened for BSC the last time they toured and also opened for Alter Bridge along with Shinedown a couple of years back. Tickets will be available through LiveNation and TicketBastard so prepare to be shafted violently somewhere intimate in terms of booking fees, transaction fees, and ludicrous delivery charges. Also, get in quick before the usual tours buy all the decent tickets and put them up on Ticketbastard’s licensed “reselling” site for a 200% markup.